The Genealogue: More Mischief at Monticello? Thomas Jefferson Clayton II (formerly Ronnie R. Clayton) believes that his great-great-great-great grandfather was "Yellow Tom"—the spitting image and unacknowledged son of Thomas Jefferson. When TJCII told the new Thomas Jefferson Foundation staff at Monticello, in a telephone conversation, that his grandmother told him he had three grandfathers named Thomas Jefferson, starting with his grandmother Rena Bell Clayton's own father, he was ridiculed and laughed at. Monticello told Clayton that he needed documents to prove these facts instead of only his grandmother's death bed confession. I think I can explain the look on their faces. After all, you couldn't swing a dead white European male in 19th-century America without hitting someone named "Thomas Jefferson." Clayton says his family has a "right to a DNA test" to prove that he descends from Jefferson. It's not clear from the article what prevents him from swabbing his cheek and sending his cells off to a genetics lab. Given how widely the rare Jefferson haplotype has been publicized, one would think the guy on CSI could run a sample through his Instamatic Genealyzer and come up with an answer before the next commercial break. 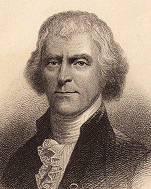 A significant flaw in Clayton's theory is that "Yellow Tom" seems to have been a fabrication of one of Jefferson's political enemies, James T. Callendar, who wrote in the Richmond Recorder in 1802 that “It is well known that the man whom it delighteth the people to honor, keeps and for many years has kept, as his concubine, one of his slaves. Her name is SALLY. The name of her eldest son is Tom. His features are said to bear a striking though sable resemblance to those of the president himself." Problem is, Sally Hemings didn't have a son named Tom, unless it was Thomas C. Woodson—definitely not Jefferson's son. I met Mr. Clayton 2day. He bears a striking resemblence 2 Thomas Jefferson the President.